Love these chairs. Although with years of use they don’t scrub to a perfect white as easily. Add a vintage feel to your decor with this white accent chair set. Including two chairs, this set features ergonomic molded plastic seats and each retro accent chairis designed for comfort and style. Wood legs with steel hardwareaccents complete the look of this mid-century chair set, while theblack plastic tips on the end of each leg protect your floors fromscratches and scuffs. The minimalist design and eclectic stylingmake this piece easy to match with your existing home decor andfurnishings. I spent a couple of months researching this dowel base Eames chair and the rocker version, almost pulling the trigger on the Modernica fiberglass proximity ($400!). The chairs arrived in 2 days, shipping cost a couple of bucks, and I put them together easily (4 hex screws, not complicated). General Measurements are very close to Eames specs listed on Design Within Reach's site (about a half an inch shy on all dimensions). Plastic Shell Finish is pure bright white, with subtle grained texture (similar to an egg's shell) only noticeable close up. The product detail shot looks to be more of a glossy finish, but the actual product is definitely matte. Very subtly "dimpling" noticed on seat above 4 areas where base attaches to the chair. This may very well be the case with the legit Eames version too, but worth mentioning. Base is adequate. Black cross beams with silver hex screws. The wooden dowel legs are fine- lighter colored birch (or perhaps "beech") finish. Glossy-ness of urethane finish on the wood is slightly cheap looking- though it should dull with time. I've seen the White on White version in person, and it excels in this area- their version features a more rich looking walnut, but is more expensive. Black floor caps on bottom of legs are nothing to write home about. All in all, a good product for the money. This set of Retro-classic White Accent Chairs reminds me of my funny and full of excitement young hood. As soon as I have seen them on Overstock the great memories came back. Although I have a modern living room these great classy accented retro chairs look amazing in the room. The chairs are high quality, giving a great design and comfort on affordable price. I would recommend them for every retro fan. This set of chairs is great for the price. It's an obvious knock-off of some well known chairs, and I would say the perfect option for anyone who wants to add a touch of good design in their living space for a small price. The quality is good overall, no complain here. Screwing the legs in the plastic (some pre-drilled holes) wasn't super easy but not hard either (10 min for both chairs). The chairs look sturdy but we only had them for about a month now so I can't really judge. They are very confortable and thanks to the armrest feel solid enough (the plastic is a bit flexible but not too much). The materials used don't look super high-end but surprisingly not cheap eather, and thanks to the simplistic design of those chairs the result actually looks as good as the branded ones (unless maybe for design professionnals who are used to work with the originals). We bought only 1 pair (2 chairs) and use them on the 2 ends of our reclaimed-wood industrial table, they look fabulous. At this price, we're not too worried about using them every day for dinner or just seating with friends. The description on the overstock.com website + all the customer reviews really allowed us to make an informed decision. Maybe more pictures with a closer look at the chairs from different angles would have been nice. Love these chairs. And everyone else does too! They are knock offs of more expensive chairs, but are great quality. I am a heavy guy - about 230lbs - and these fit me nicely and are super strong. However I have noticed that I need to tighten the screws about once every couple of months - so save that allen wrench! Also, as they are white, they get dirty fast. I live in NYC and it's dusty. These get grey after about a month. I get a bucket of water, wash cloth and some Mr. Clean, and it does the trick. You will need to do this about once a month or so. But again you will have that with any white furniture. These chairs do not creak, wobble or make noises. They do have some dimples around the leg areas on two of the chairs but I did look at the more expensive kind and they have the same. Oh and every designer on HGTV is now using chairs like these. We got these easy to assemble a mat white chair with wooden legs. Little nicks in the legs due to packing but easy to sand & oil out. Very comfortable but they do not match the Wood Leg White Accent Chairs (Set of 2) which are pearl. The overall design of these chairs is above very good. Although some of the "designer" manufacturing would include fiberglass and stainless steel, this version is excellent. The plastic is high quality, the legs are 100% wood w/black chrome - very happy with the look. The assembly however, was very painful. For starters, no instructions whatsoever, and although you can figure out where the legs would go - it's virtually impossible to tightened the last leg. The chrome is attached to the wooden leg and cannot bend very well therefore requiring you to strain your wrist to get the tiny screw to attach the leg to the platform seat. I ended up placing the screw underneath the leg, which fit but wasn't designed that way. Perhaps the design was to have the legs tight enough to hold weight. Regardless, it should've come with instructions. Nice product though. These accent chairs are working perfectly in my mod apartment. They are lightweight yet sturdy and add just the right touch of classic, retro style. The ergonomic seat is very comfortable and I can sit in these chairs for hours at a time. The assembly is surprisingly easy. Soon after the packages arrived, these chairs were ready to rock and roll! Overall, I am extremely happy with this purchase. Thanks Overstock! I bought two of these chairs as the finishing touch to my listening room in my home. I wasn't sure they would be comfortable to sit in for a period of time, but they were totally the look I wanted so I gave it a shot. When I easily put them together (no instructions necessary--and took only minutes with the help of someone holding the base in place) and sat for the first time I was pleasantly surprised. This chair is quite comfortable and supports my lower back with its form. The plastic material is incredibly soft and allows it to give as you need, while remaining sturdy at the same time. Weird, but true. I also bought 2 of the similar "Vinnie" rocking chair versions like this at the same time and everyone so far has preferred this chair over those. THEY LOOK ABSOLUTELY INCREDIBLE in this room! I have chalk black walls with white trim and these pop magically. I will also bring these into the dining area when my nephews visit---even though they are white, these chairs are so easy to clean! KID-FRIENDLY IS A PLUS! I like the form of these visually and functionally. The slight curve of the arm rest allows for just the right amount of comfort and the back support I mentioned previously is great. If you're on the fence about this chair, I say take a leap and get it. I love this set of retro chairs and you just can't beat this price!! They look great in my modern loft.... very simple and cool. Super easy to assemble! Very sturdy, high quality chairs. You do have to assemble. I originally ordered a set of 2 as accent chairs, but once they arrived and I put together, I decided to order 6 more for a total of 8 to have as my dining room set. I always get compliments on them. I love these chairs! They are a great looking knock off of a midcentury modern icon that I could never afford otherwise. Shipping was super fast, simple to put together (I think it took less than 10 minutes to assemble both) and they are also quite comfortable. One bit of info that is not included in the description is that the arm hieght is 26" off the floor. I took a risk ordering these not knowing if they would fit undr my dining table or not and fortunatley, they work for me. I love these chairs. They are super comfortable and easy to clean, which is exactly what we were looking for with active boys at home! The original Eames chairs are fiberglass with a smooth finish, but these reproductions are molded plastic with a very slight texture. When they get dirty I need to use a little elbow grease to get them completely clean, whereas the fiberglass wipes off super easy. Still, for the price they are well worth it. I would buy them again! Good quality, sturdy chairs. The holes for the legs didn't line up perfectly, but it wasn't a big deal and we made it fit pretty quickly. Great design at a fraction of the cost! I would go with the armless chairs if you're looking for desk chairs as the arms are pretty high and would not fit under my desk. Awesome chairs overall! Unfortunately, there were a number of defects in workmanship of this product. There were several scratches on the chair legs, even though the box was not damaged -- the legs should have been wrapped individually before packing. Also, several of the screws in the legs were uneven and not well installed, and the holes where the screws were placed had rough edges in spots. It was a shame that the product had these defects, as I was really looking forward to having the chairs in my home. The seats appeared to be in fine condition, although I never got so far as to attempt to attached the seats to the legs because of the previously mentioned defects. I decided not to try to order replacements as I feared that the replacements would be defective as well. I did appreciate that Overstock covered the cost of return shipping. Too bad -- perhaps I was just unlucky. We purchased these chairs for our mid-century modern bonus room, hoping they would stand up to a lot of use by teenagers. We have not been disappointed! These are exceptionally sturdy chairs. Much higher quality than we anticipated for the price, and they look marvelous, too! These chairs are super cute! I wouldn't say they are high quality, but they are good enough for the price and one would be hard-pressed to tell the difference between these and Eames chairs. They are also quite comfortable. I added a fluffy white bolster pillow to each and placed them in an all white guest room. They're perfect! Minutes to essemble them - no manual or tools needed. Pair looks great - the plastic does not have a smoothed shiny surface which I think would be esthetically even more pleasing. The best part: they are really comfortable. Used it for hours sitting at my desk. They look great but the underneath comes loose very easily so you constantly have to tighten it. These chairs are exactly as pictured! They are comfortable to sit on and look great from far, but the quality of the chairs is not super great. The screws have to be retightened all the time. The chairs became wobbly pretty soon. However, if you like to go for a designer look and you don't want to break the bank, then this might be a good choice. Purchased these chairs 5 years ago! Still sturdy and clean! Purchased quite a few of these for an office renovation and they still look good. A great value. Client is pleased with purchase and employees like them A lot. These chairs are great. I’ve had them for several years now and they are still very stylish. Love the Mid Century Modern vibe. Thinking of customizing by adding color. Overall great value. For light chairs, these are very durable. We have them in our architectural office entry where they have served us well as the modern knock-off of the Eames plastic molded chair. "What is the floor to seat height?" About 16 inches. I purchased two of these over a year ago and i love the look of them. I have them at the end of my bed with a pillow on each for an accent color. I sit on one of them every day at my computer. "Hi. I got the package today but the Instruction was not included in the package. Can you email me one?" I did not receive instructions either. I just youtubed how to put them together. It was very easy. "I couldn't find the assembly directions when trying to put them together today. Could you forward them to me in an email or some form or fashion? Thank youa!" "Which side chair without arms matches these chairs? I would like to order a set of these chairs plus 4 side chairs without arms but I would like them to match." "Is there anyway I could buy just one chair?" We do not break up sets, we are sorry. 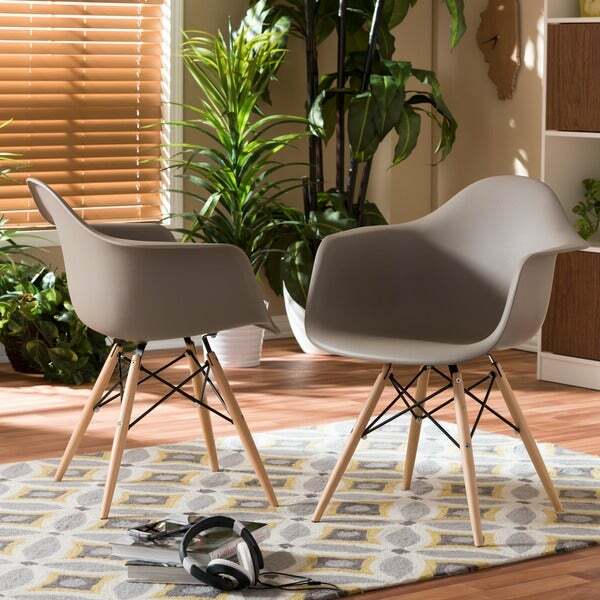 Please check out the Retro Eames Style Wood Accent Chair with Arms, item 17944881. "I would like to order some replacement base for this item is that an option? And if so what would be the price? " "How much weight can these withstand?" Hello Kristine, we do not currently weight test items. We apologize for any inconvenience. Thank you for shopping with us.